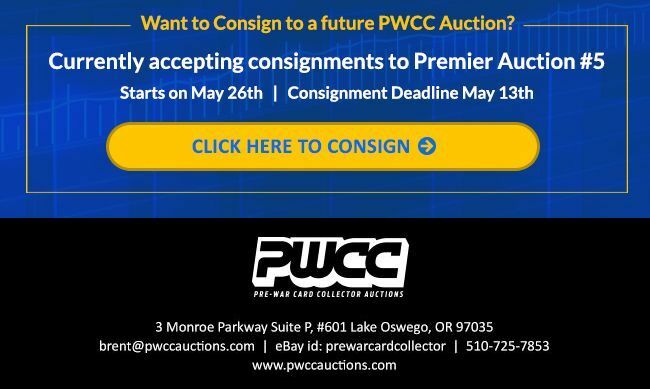 With listings coming to a close throughout the month of May, PWCC Premier Auction #4 packs all the star power of their previous 2016 collections. Highlights include a 1952 Topps Mickey Mantle, 1971 Topps Thurman Munson PSA 9, 1957-58 Topps Bill Russell rookie card, 1954 Topps Hank Aaron rookie card, and 1953 Topps Willie Mays PSA 8. There is also a Gem Mint, 1986-87 Fleer Michael Jordan rookie card (PSA 10) as well as several more for MJ. Additional key cards are documented below. However, this is not all as 2016 PWCC Premier Auction #4 has plenty of other notable options among the 11,000 lots closing in May. Review all listings at PWCC's eBay Store or through their direct website at http://www.pwccauctions.com/.